DISCONTINUED.The Procombi Essential Combi boiler from Glow-worm is a condensing, wall mounted boiler. It is a highly reliable boiler with a variety of features and benefits. As a Combi boiler this model acts as both a water heater and a central heating boiler wrapped into one. This means that no hot water cylinder is required, helping to save you space in your home. This boiler has an output of 24kW which is perfect for the smaller homes with only one bathroom and not to high demand on heating or hot water. A 28kW is also available for larger homes with multiple bathrooms. 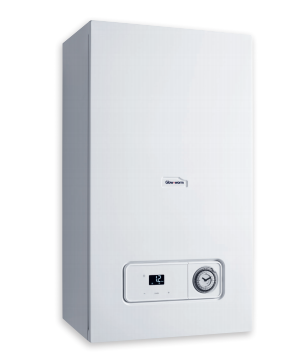 This boiler is a highly efficient unit with an efficiency rating of 89.2% making it A rated. Key features include a bright LCD display with a simple to use analogue timer and straightforward programming which helps to give you maximum control over the unit. This boiler is also compatible with the complete range of Glow-worm controls including mobile phone app based controls. The simple and smart design includes a high grade aluminum heat exchanger and a Grundfos modulating pump helping to provide the unit with great performance. A 2 year warranty is included to give you peace of mind you have purchased a highly reliable unit.